This high-quality dog leash, made from nylon mesh with reflective LED lining, is strong and durable. The soft cushioned handle grip makes it comfortable to use and the strong metal hook keeps your pet safely attached. Don’t take any risks when walking your dog in the dark. 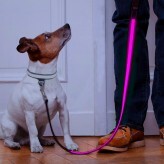 The bright, reflective LED strip along the length of the leash will keep you and your pet seen. It is USB chargeable and fully charged in 2hrs. 3 light modes: Fast flash, slow flash and bright glow. Simply press the button below the handle to switch between modes. It is lightweight and flexible, portable and easy to carry. It is 120cm long and can support up to 120kg of tension, suitable for almost all dog breeds. Weather resistant, this lead will keep you and your dog seen even in the harshest conditions. The Auraglow LED dog leash is the best way to keep you and your dog safe when walking in low light conditions. Simple and strong, it is easy to use with a single button to switch through light modes and the nylon mesh construction is weather resistant and built to last. It is USB rechargeable (cable included) and charges in 2hrs, with battery life dependent on use: Slow flash >5hrs, fast flash >4hrs and bright glow >2hrs.